It was always a thrill when my mom took me to the store as a kid and let me pick up a few comic books so it is a little disappointing when I pop in to my favorite spot to pick up some now and see the place filled with 30 to 60 year old guys and gals with no trace of anyone who has probably had to do homework for years. Now that may be do to changes in tech ... kids get their stories through video games, television, and digital publications versus old fashioned paper and ink book ... or the price of a comic (I could buy them for .50 / .65 / .75 cents a pop as a nine year old versus it costing $2.99 to $4.99 or more now to purchase just one book) which is where I have to admit contributing to the kids free zone myself because I occasionally take my children to the comic book store with me and buy them something but really can't afford to get them hooked on a series plus pick up some of the items I want to read on a regular basis too so more often than not leave them at home myself rather than entice them with cool stuff they can't have or spend a paycheck at the store so everyone leaves happy. In a few years when my kids are older and more proficient readers, I'll probably take a break from what has become an indulgence to take my mind away from some of the headaches of work/life and either buy comic books just for them to read or not at all for awhile as not to be too selfish on how I'm spending money. That being said if I see a fun comic book that is appropriate for our whole family to sit down and enjoy reading together, I'll probably always pick it up to buy. 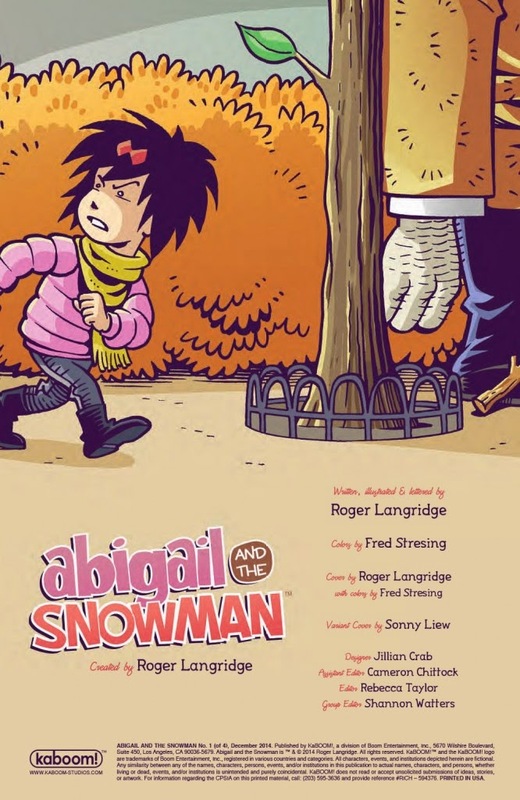 One example of that is the brand new comic book mini-series ABIGAIL & THE SNOWMAN which had its first issue of a 4 part story arc just released on December 31, 2014. Published by the kaboom! imprint of Boom Studios which is targeted at producing comic books for young audiences this story will thrill both kids and parents alike. If you want to enjoy the comic book medium with your children, pick up this series, snuggle the family together and enjoy a quirky and humorous adventure story that people of all ages can enjoy together. 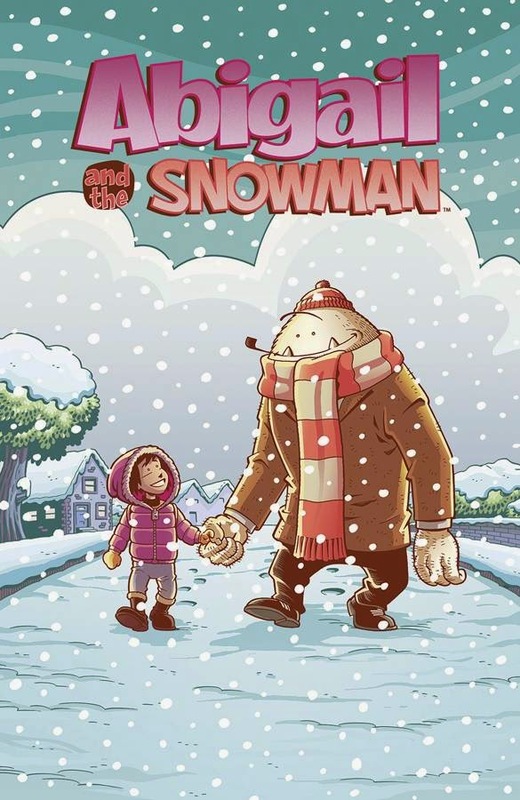 As a parent, I wish there were more comic books like ABIGAIL & THE SNOWMAN for families with kindergarten and elementary school ages children that are filled with inspiring artwork and tales providing a more grown up format to expanding upon the story board books so popularly read to kids at preschool and library circle times. ABIGAIL AND THE SNOWMAN begins with a young nine year old girl named Abigail moving to the quiet little town called Shipton-On-Sea. As she is exploring and becoming accustomed to her new surroundings, she shockingly bumps into a yeti on the run. The yeti, officially known as Specimen 486, has escaped from the government's Ministry of Unusual Phenomena (oh by the way this story is set in Great Britain) and is alluding these mysterious Shadow Men ( government agents ) that want to return him back. After affirming that Specimen 486 is really a yeti, Abigail agrees to help the snowman return home. How does a little girl help a snowman travel from Britain to his real home a world away? You'll have to read this comic book mini-series to find out! Written and illustrated by Roger Langridge whose family friendly comic book resume includes THE MUPPET SHOW COMIC BOOK and JIM HENSON'S THE MUSICAL MONSTERS OF TURKEY HOLLOW this mini-series will remind kids of wacky adventures of LILO & STITCH or MONSTERS INC while its artwork will trigger fond memories of CALVIN & HOBBES style humor for parents. 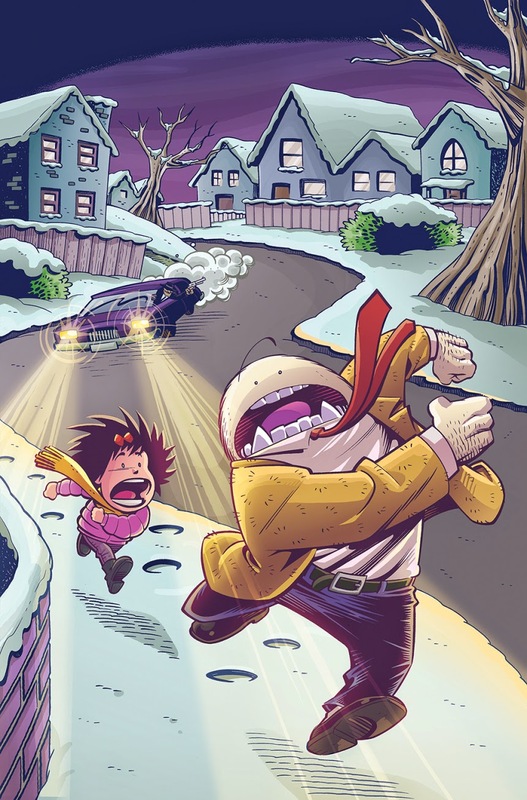 Don't miss picking up ABIGAIL AND THE SNOWMAN #1 at your favorite comic book retailer now!